When Edward “Ajax” Turner founded the Ajax Beer Co. in 1934 near Nashville, TN, delivering product from his warehouse floor through the retailer’s door was a much simpler proposition. He had one truck, which he drove, loaded with beer from one brewery. He could probably count his stops on two hands, and his wife, Geraldine, was the only other employee. She ran the office while Mr. Turner ran the route. Oh, what a difference 80 years makes. 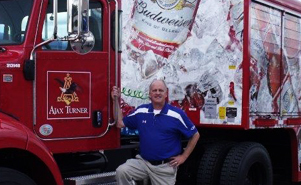 Today, Ajax Turner Co., Inc. operates a fleet of about 200 vehicles that deliver around 8 million cases of top notch beer brands from 22 breweries – led by the Anheuser-Busch portfolio – to some 3,500 customers over 50 different routes, supported by a staff of 250 people. In 2004-05, the company shifted from a totally pedal sell system to 100% pre sales and set up its fleet to provide customers with an incredibly efficient delivery service. The company’s transition to pre sell started with its bulk routes. “We originally used 53 foot box trailers for supermarkets, and then saw we could catch some high volume cstores with the end loaders as well, so we added 4 more just for those and equipped them with 6-wheel aluminum hand carts,” explains Williams. Ajax Fleet Manager Gil Williams with a Mickey side loader featuring the new Budweiser graphics.